Our	time	proven programs have been a bennifit for an army of business and cities just like yours. See why our clients come back year after year after year! you and your local businesses are looking for! We have a unique concept formed from traveling across the United States. Working with Visitor's Bureau's, Chambers, and cities who join our National Travel Program. Our Travel Program promotes and markets your hotels, restaurants, shopping and attractions locally, as well as state and nationwide. The program will lists the majoity of your businesses (FREE) at no charge on our web site with hot links to their own home pages. This is an excellent way to promote the businesses in your area since using these travel coupons/vouchers provides travelers, visitors and residents with the discounts and savings they're looking for. Coupons are a great way to measure response and once we create your coupons/Travel Vouchers, they are posted to your Travel Pal home page and linked to from your website where everyone can have access to them. We are also proud to provide you with our "National Value Card Program" This provides Discounts and Savings not only to your merchants but merchants in other States as well. In addition we publish you in our Full Color Regional Travel Guide with maps and information about your region. 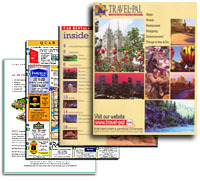 Our travel guides are distributed through CVB'S, chambers, tourist attractions, airports, car rental agencies, welcome centers and many other high-traffic outlets though out 8 Western States. Please visit the remainder of our web site and notice the many cities participating in our Travel Program, including...Plano CVB, Waxahachie CVB, Temple CVB and Killeen CVB and many many more. Cities that are all participating in our "Create your own Coupon Kit Cover, Coupon Brochures, V-Card, and Virtual tour programs." Click on our Coupon button to view the coupons now being provided by cities. Note the links at the bottom of the coupon pages to view their Kit Cover and Coupon Brochures. Our "Media Page" also provides additional information about our program and the prices of the various levels of participation. to $5,000.00 Dollars for 1/2 page in our Travel Guide plus your Internet program and Coupons plus your Kit Cover and brochures. We will promote and market your city for 2 years. Special Kit Cover and Coupon Brochures let's you personally hand out your own coupons to your visitor's and travelers. Remember to see a sample of our custom design Kit Covers on the coupon pages of Temple, Plano and Killeen at the bottom of the coupon pages. One more important reason people choose us... because our program is all-inclusive. We do everything for you. All you do is provide us with a list of businesses to contact and we will explain to them their FREE coupon, listing benefits and Value Card. Your only task is to e-mail us 7 photos so that we can design and build your own custom internet page on our Web Site with hot links to all your businesses. Several Cities currently have there own discount program going and have signed up with us to promote their current program nationally and locally through our web site. We look forward to bringing to your businesses the significant benefits of our Travel Program. © Copyright Travel-Pal International. All rights reserved.